Walter Mitty (Ben Stiller) brings some swagger to this cake. He makes it look cool to carry cake around. Maybe we should try and take his lead and do the same? Wouldn’t it be fun? 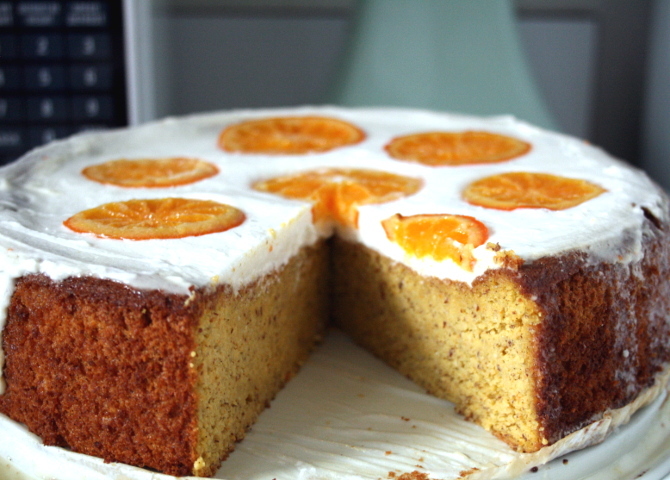 Shh…..don’t tell Walter that I used the tangelos that I got from the farmer’s market instead of clementines (either clementine or tangelo works well in this cake recipe). Tangelos, a hybrid of mandarin orange and grapefruit or pomelo, are my favorite citrus fruit. I don’t think you can tell too much if you used tangelos instead of clementines. By the way, this cake looks a little banged up as I took the pictures the day after I made it. During the night, I think it had a tussle with the some tupperware in the fridge. Almond meal is the other main ingredient in the cake. I got this at Trader Joe’s. I diverge a little bit from the original recipe as I use a coconut cream-based glaze without any confectionary sugar. But, you have to plan ahead for this glaze. You need to chill the can of coconut milk overnight to separate the cream from excess coconut liquid. That’s where you get the icing consistency without any powdered sugar. I was also surprised to know that this cake uses the whole fruit–peels included, but sans pips. You can either slowly simmer them in water for a couple of hours or microwave them until soft as the recipe below dictates. Make sure to take out the pips before you blend the clementines or there will be a bitter edge. I also diverge more from the original recipe as I don’t use any leavening. No baking powder because it was Passover when I made it. So, to get some lift, I separated the yolks from the whites and plopped the almond meal and the rest of the ingredients (excluding the whites and the cane sugar) in the blender and blitzed to make a batter. This is like a sort of sponge-cake technique. Here are the egg whites and cane sugar being whipped to soft peaks. Once the egg whites are done, they are gently folded with the yolk-almond mixture. Then bake in a 8 or 9 inch spring form pan. Either size will do. 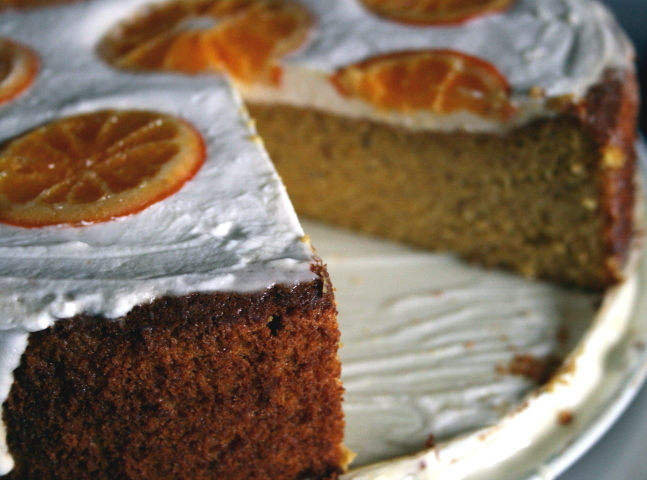 It takes about an hour to bake, so making this cake does take some time. It’s a labor of love for whoever you make it for, as Walter’s mom does. Make sure to bake until a skewer poked in the cake comes out clean. It may get golden brown before the baking time is up, so cover with foil, or my preference, pan-lining paper. Let it cool to room temp on a wire-rack before removing from the tin and decorating. 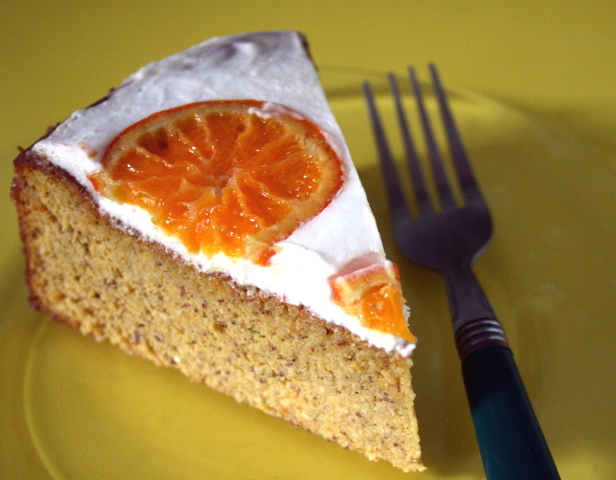 Oh my darling, clementine cake! You are a rustic charmer. I like the touch of candied clementines as in the movie cake. The slices don’t get hard as it may seem as the syrup just enhances the citrus flavor and keeps the integrity of the fruit. They are soft enough that you can also slice right through them, so you don’t really struggle to cut the cake like some fruit decor might do. Poke each clementine with a knife 3-4 times. 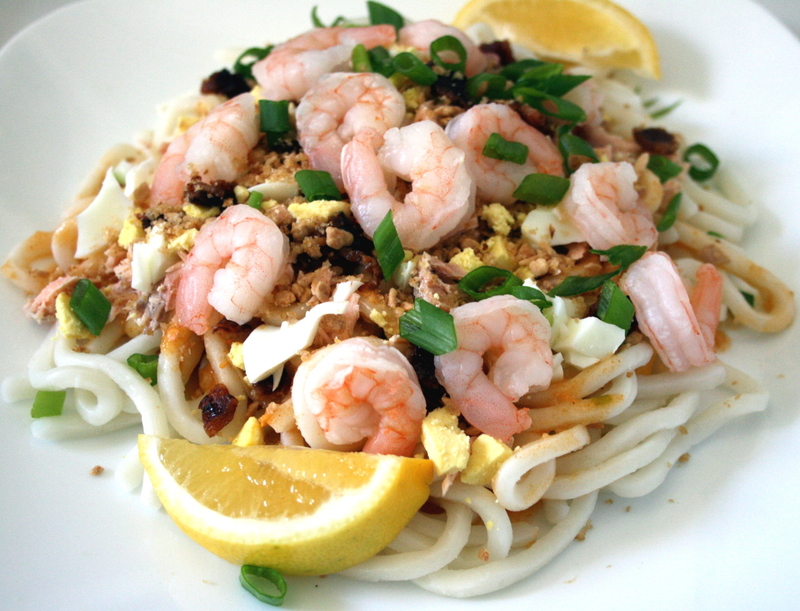 Place in a microwave-safe bowl, covered with a microwave-safe plate and microwave on high about 4 minute or until soft. Alternatively, you can soften the clementines by placing in a small pot (peels and all) and add enough room temperature water to cover them. Bring to the boil and simmer for 2 hours or until soft. Let cooked clementines cool. While cooling, heat oven to 375 degrees F. Line an 8 or 9-inch springform pan with a circle of parchment paper and grease with spray oil, butter, or coconut oil. Cut each clementine in half and remove the pips. Roughly chop the de-pitted clementines and puree in a blender or food processor. Add the egg yolks to the blender/food processor and blend until smooth. Dump in the ground almonds, salt, and vanilla. Blend/process until thoroughly combined. In a clean bowl, whip the egg whites until frothy. While whipping, gradually add the cane sugar and keep whipping until soft-peak stage. Gently fold the egg white mixture to the clementine-almond-yolk mix until thoroughly combined. Pour the cake batter into the prepared 9-inch springform pan. Place the pan on a baking sheet and bake for about an hour (until a skewer poked in the middle of the cake comes out clean). You will have to cover the cake with parchment (or foil or pan-lining paper) at about the 30-40 minute mark so the top doesn’t over-brown before the inside of the cake finishes baking. Let cool on a wire rack. When cool, you can take the cake out of the tin and decorate it. Open can and take the coconut cream that has solidified on the top and place it into a bowl. Save the liquid below the cream for smoothies or other beverages. Whisk in the rest of the ingredients. Can keep in an airtight container in the fridge a day or so ahead of time before glazing the cake. Place the water and honey in a pan. Mix until dissolved. Let come to a boil. Add the clementine slices and simmer on low for about 20 minutes. Make sure to keep the clementines submerged in the syrup. Place slices on a silpat-lined baking sheet (or parchment) and let cool before using for cake. This entry was posted in Baking, Food, Gluten-Free, Holidays, Recipes and tagged Ben Stiller, Cake, citrus, clementine, Clementine Cake, coconut milk, Nigella Lawson, Passover, Secret Life of Walter Mitty, Walter Mitty. Bookmark the permalink. 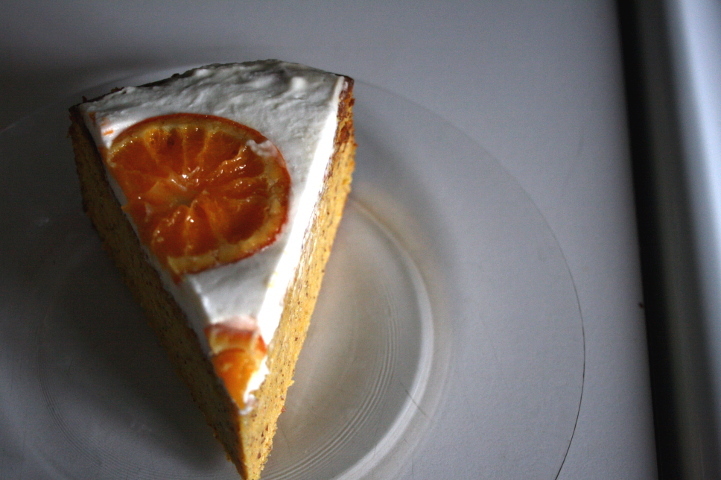 It’s a beautiful cake, I haven’t seen the movie but am intrigued about the clementine cake and it’s use in the movie. It really does sound delicious! Thanks so much 🙂 It is a nice cake to have when you want to satisfy a cake craving, but don’t want to have something very rich and high calorie in comparison. I’ve had a slice for breakfast, LOL. how pretty! And I love the switch-outs you made. Yum, tangelos 🙂 This movie is going on my netflix queue, if for the cake only! I hope you enjoy it! It bet it would be really good on a coconut cake! Thanks 😀 It definitely was! What a gorgeous cake. I have some light coconut milk on hand – would that work in the icing? This post really stood out. Love your recipe and photos, too! I hope you enjoy the recipe! 😀 The movie was pretty good, in my opinion. I haven’t tried it with light coconut milk so I can’t say for sure. I’m guessing that it may make for a more liquid-y consistency and a really thin, transparent glaze. Like a syrupy glaze that you might put on a rum cake. This cake looks divine. Almonds and citrus – my favourite ingredients. 🙂 Thanks for stopping by my blog. I’ve bookmarked yours to keep coming back to. Great recipe! Do you think I can use navel oranges for the recipe? That is all I have right now. Thanks so much 🙂 Navel oranges should be good too!